Who, Adjusted For Inflation, Is The Richest Man In History? During The 1979 Iran Hostage Crisis American Diplomats Escaped Iran By Posing As? If you’re a citizen of a Western nation and not much of a history buff, you can be forgiven for not knowing who history’s richest man is. 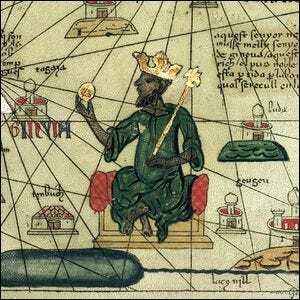 While there’s much talk of the wealthy titans of the current and past ages such as Bill Gates and John Rockefeller, we need to dig further back in time to find the man who, when his fortune is adjusted for inflation, is the wealthiest person to have ever walked the earth: Mansa Musa I, ruler of the West African Malian Empire in the early 1300s. Adjusted for inflation, his fortune was worth a staggering 400 billion dollars. That number is shocking enough as it is, but consider that he lived in an age long before stock markets and electronic banking. Musa’s wealth wasn’t the kind that existed in accounts and ledgers, it was the kind that existed in glittering piles. When he went on a religious pilgrimage in 1324, for instance, he traveled with a retainer of 60,000 men, 12,000 servants (500 of which had the sole job of marching before his procession with staves adorned with gold), and his entourage came with 80 camels loaded with hundreds of pounds of gold each. Musa spent and gave away so much gold as he traveled through Egypt, in fact, that he inadvertently destroyed the gold market and crippled the Egyptian economy for years after. Image from the Catalan Atlas of the Known World (1375) by Abraham Cresques.